This week, I tried a couple of new (for me) restaurants around town, Mullets and Jethro's. 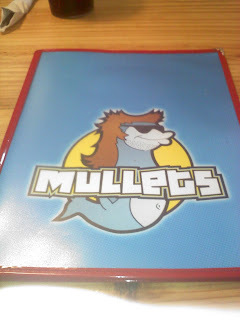 Mullets had a big write up in the Datebook last week, so the work ladies and I ventured out to lunch there last Wednesday. After a few problems trying to find it (We thought the cute fish on a pole could be spotted from miles away. Not so much. 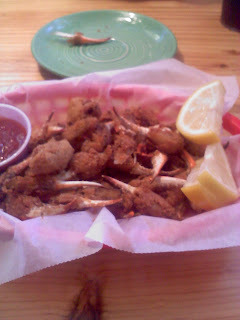 ), we finally made it and were pleasantly surprised. This spot sits on the river, caddycorner to Principal Park. There are a couple of decks for nicer days, and the menu is pretty big and includes breakfast. It was hoppin' when we stopped in for lunch around noon. Shot of the menu. Love it. 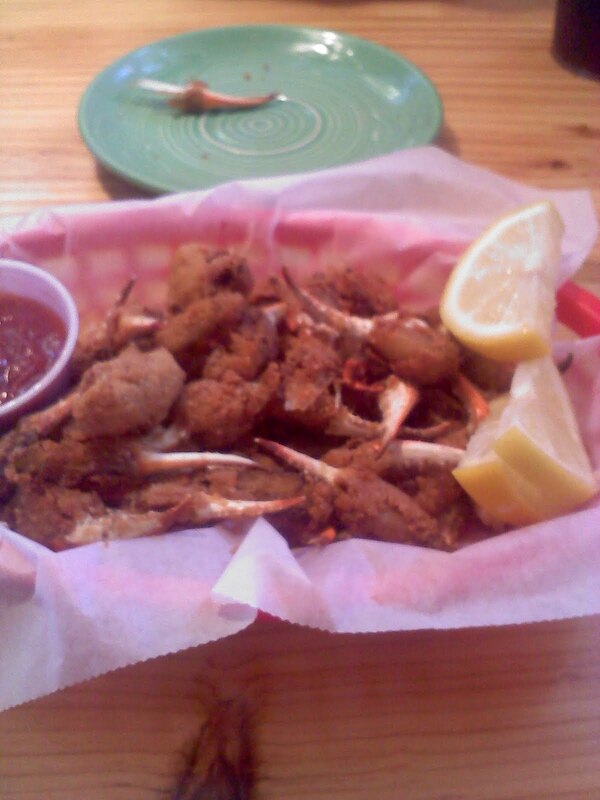 I had the crab claw appetizer as my lunch. Yum yum. B and I headed over to Jethro's Friday night for some BBQ. I had driven by this place over by Drake tons of times but never actually stopped in. We got there around 6:30 and there was not a space to be had in the parking lot, which is always a good sign! It's a sports bar atmosphere, and when we were there the crowd was mostly families. B got the 2 meat dinner with brisket and pulled pork and I got the single meat dinner with only brisket. We both agreed that the pulled pork was GREAT, as were the sides (Um white cheddar mac and cheese...HELLO?!! ), but the brisket was probably something we would never get again. The cuts were thick and really fatty, not the best. I did however love the fact that there was a drink called the Hillbilly Iced Tea on the menu (Sweet Tea vodka & Lemonade). It was also nice that they had such a variety of sauces on the table, all in cute little honey bears. 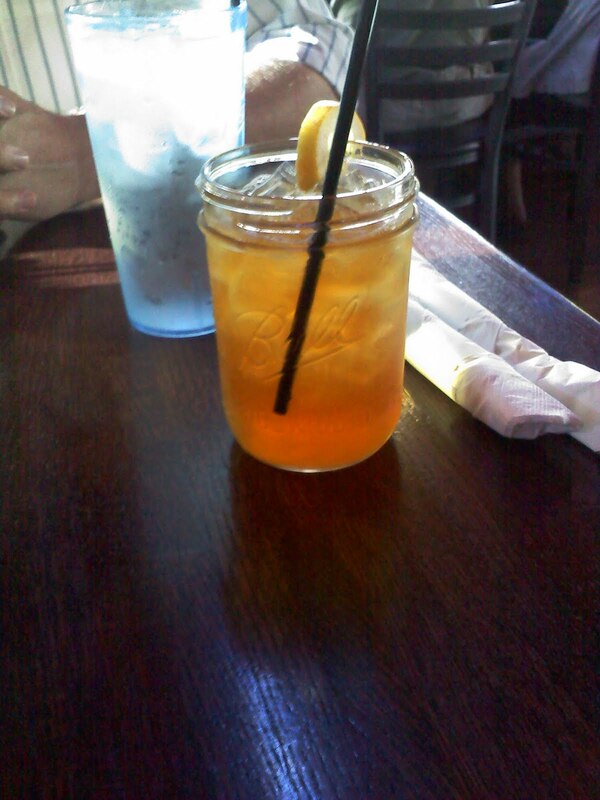 Hillbilly Iced Tea....made even better by the fact that it's served in a Ball jar! 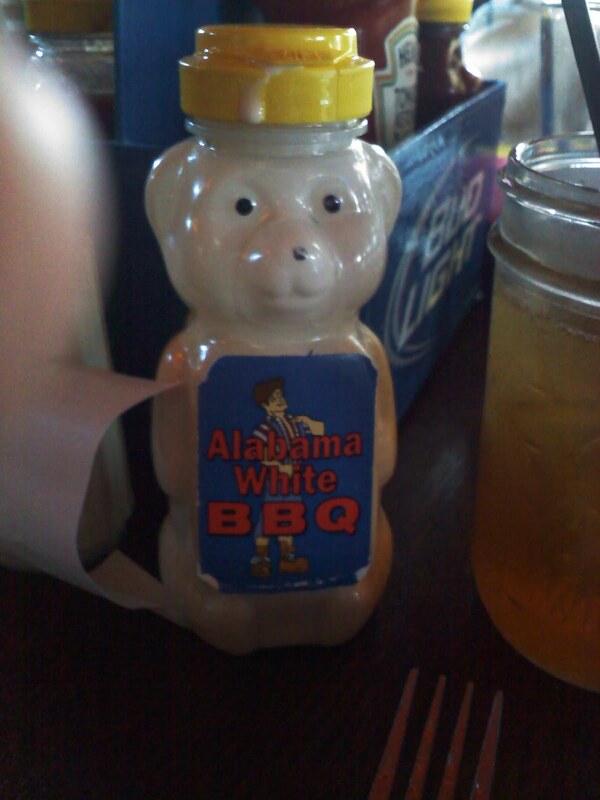 My sauce of choice. Duh. I think it's safe to say that I would definitely make return trips to both these spots! :) Thumbs up!